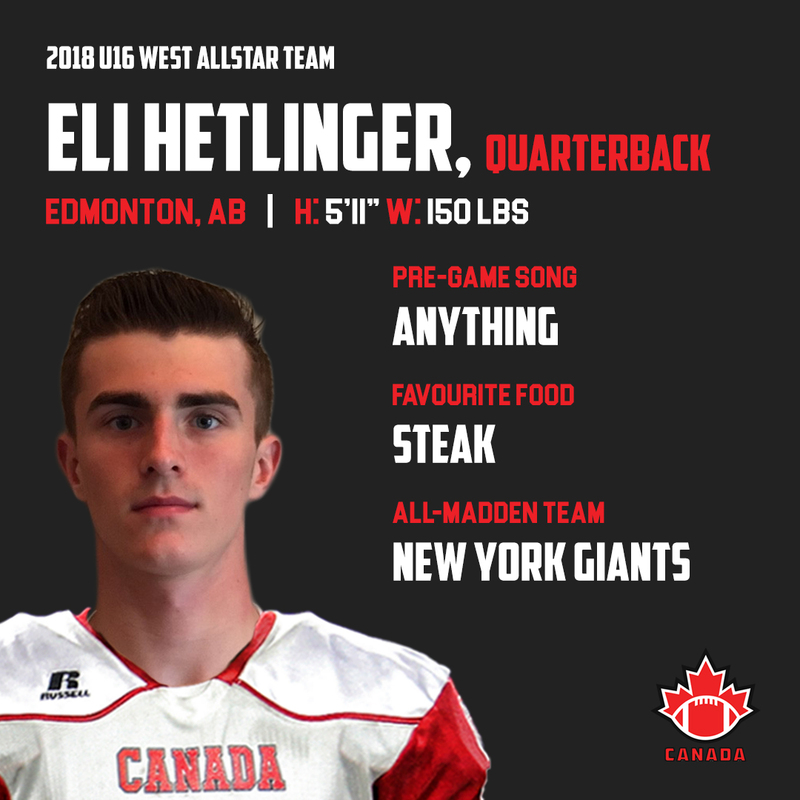 Eli Hetlinger is a quarterback from Edmonton, Alberta that will be suiting up for the 2018 International Bowl as a member of the Under-16 Western Canadian Team. The quarterback’s first introduction to the sport was through the Canadian Football League (CFL). Hetlinger’s passion for the sport runs deep as he studies the game meticulously. Throughout his career, the Alberta standout has played for multiple teams including the Edmonton Chargers and the Harry Ainlay Titans of the Alberta Schools Athletic Association (ASAA). For Hetlinger, the best times of his career were while he played for both the Titans as well as Team Alberta. “Those two have been really fun,” added the pivot of the highlights of his career. An unforgettable experience for Hetlinger was leading Alberta to gold at this past July’s Under-16 Western Challenge in Lethbridge. Hetlinger credits his parents for bringing out the best in him on and off the field. “I always look up to them because they are amazing parents to me,” expressed Hetlinger. Not being able to come up with the words to describe his reaction to making the national team, the Alberta quarterback was happy his hard work finally paid off in a major way. Next story Get to know U16 East All Star Team Offensive Lineman , Chris Weber!